Can China's Big Shoe Brand Make Tracks in the U.S.? Is Google the Omen of a U.S.-China Trade War? When Li Ning first came to the American West, he shocked the world by winning six Olympic medals in gymnastics  three of them gold  during the 1984 Los Angeles Games. Prior to 1984, the People's Republic had never even won an Olympic medal, and Li Ning was China's undisputed star of the L.A. Games, becoming an instant Chinese sports legend. This year, Li is back on the West Coast  or rather, his eponymous sportswear company is  setting up its first U.S. retail store in Portland, Ore., not far from the headquarters of archrival Nike. This isn't the first time China's biggest shoe company will go toe to toe with Nike, which has aggressively marketed itself in China. But for once, it won't have home-court advantage. Eyes are on the Portland area, also home to Adidas America and Columbia Sportswear, to see if Li Ning can once again surprise the world by taking on American powerhouses in their own backyard and transform Li Ning into one of China's first global consumer brands. Despite the growing political influence of China, try asking an American to name a Chinese company and you're not likely to get much of an answer. While South Korea has Samsung and Hyundai, and Japan has Sony and Toyota, in the U.S., China is largely associated with the mass production of low-end goods, with few of its own international brands. To battle China's reputation for cheap imitations, Li Ning has hired top designers from Portland's rich pool of shoe-design talent and placed its high-end sportswear in an airy showroom in a Portland's chic Pearl district. The products in the Portland store do not shy away from Li Ning's origins, highlighting apparel for popular sports in China like badminton, table tennis and kung fu  games you won't find front and center at nearby Niketown. Li Ning consciously decided not to shed its Chinese identity as it expands overseas, hoping instead to ride the growing influence of Chinese culture. Jay Li, the general manager of Li Ning USA, predicts that as Chinese soft power expands, China's tastes "will become part of the fabric of mainstream culture." Says Li: "When the tide starts to turn, we want to be one of the brands to bring a new, modern China to the rest of the world." Even if most Americans don't know the Li Ning name yet, many will remember the man. After his historic 1984 performance, the tycoon leaped back into the Olympic spotlight  literally  during the opening ceremony at the 2008 Beijing Games. Suspended by cables, Li soared into the air and ran a slow-motion aerial lap around the Bird's Nest before lighting the Olympic cauldron in front of an estimated 4 billion television viewers  much to the annoyance of Adidas, which had spent some $80 million to sponsor the Games. Less than two years later, Li Ning the company is still soaring. 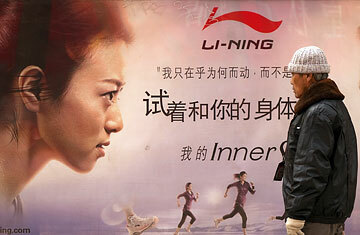 In March, Li Ning Co. reported a more than 30% rise in profit in 2009. Li Ning started his sportswear company in 1990, building it into a giant, with 2009 sales considerably more than $1 billion. With 7,249 branded stores in China, Li Ning has surpassed Adidas to become the No. 2 sports-apparel company in the country. Unlike an Adidas or a Nike, 99% of Li Ning's revenue comes from within China. But this won't be the case for long. Li Ning has signed a deal with Champ Sports, where 67 of its retail outlets in the U.S. will start selling Li Ning products. Li Ning Co. is also testing the waters in Singapore with a new showroom and has collaborated with Dutch rapper Ali B for a line of clothing in Europe. Jay Li says Li Ning will not rush its growth internationally, but he's confident it will become a global player. "We have aspirations to be a global brand, and we will eventually get there," he says. Jay Li isn't the only one who thinks Li Ning is poised to break out. The Credit Suisse Research Institute released a report at the end of February calling Li Ning one of the 27 "Great Brands of Tomorrow." Just rebranding Chinese products won't be enough for Li Ning to compete globally. The company also needs to deliver products that will help its élite athletes excel, a process Jay Li says is "half science, half art." Li Ning runs a "Global Innovation Center" in the same building as its Portland retail store, where footwear designers and biomechanic engineers lured from the likes of Nike, Converse and Adidas mix with designers from Li Ning's Chinese staff. On the wall, the innovation center has two clocks  one set to Portland time and one set to Beijing time. "This fusion comes through in our products," Jay Li says. Nike isn't shaking in its boots yet, but permanent dominance in American sportswear is never a shoo-in. When Li Ning opened its Portland retail store to the public for an hour on Feb. 15 for its grand opening, sneaker heads lined up for five hours to be among the first to own a pair of BD Dooms, basketball shoes named after NBA point guard Baron Davis. Jay Li admits they lined up "not because of Li Ning but because we have a world-class basketball shoe." (It probably also helped that Baron Davis himself was in the store giving autographs.) Priced between $99.99 and $149.99, a pair of BD Dooms does not come cheap, but the kicks have at least one high-profile fan. Davis says NBA superstar LeBron James asked him during a game, "Yo, B.D., why do your shoes look better than everyone else's?" The answer  a team of young, talented designers working for a Chinese company that has the cash to sign up an NBA star  could usher in China's first global apparel brand. As Li Ning's slogan says, "Anything is possible."